The modest mushroom goes luxe. It happens. You finally go out for a fancy meal on the town and you freeze up — what to order? What are the people at that table having? The special? The signature dish? Good God, what if someone at your table orders something better than what you're having? If you find yourself in a panic (or just disoriented by the view) at Moonstone Grill (100 Moonstone Beach Road, Trinidad), take a deep breath and order the wild mushroom risotto ($24). It's ridiculous. 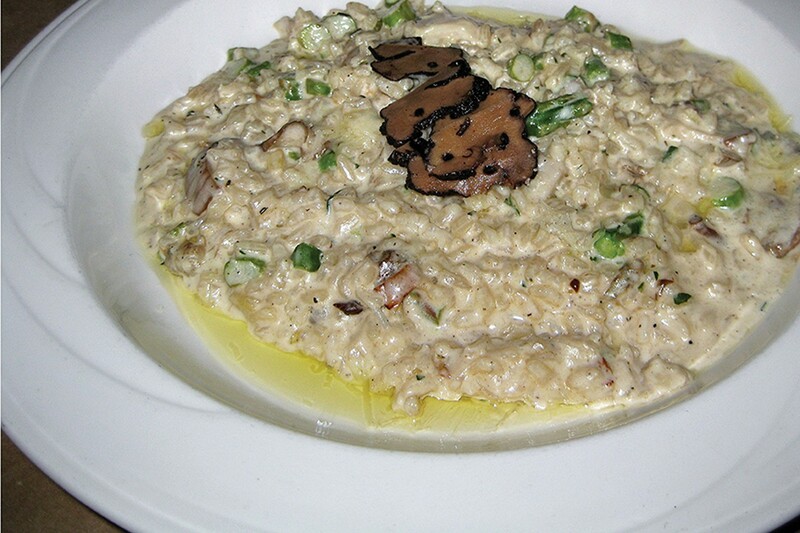 Nutty chunks of asparagus and earthy wild mushrooms in creamy arborio rice. It's a rustic comfort dish right up until some mycological hedonist in the kitchen tosses a small fistful of shaved black truffles on top and rings the whole plate with golden truffle oil. So rich and fragrant, so decadent — no need to look at passing servers to see what other diners are ordering. All must bow before your ordering prowess, especially if they want a bite. The Kahlua Pig Fries at Banana Hut (621 Fifth St., Eureka) are not an appetizer unless you dine with a small regiment ($8.99). 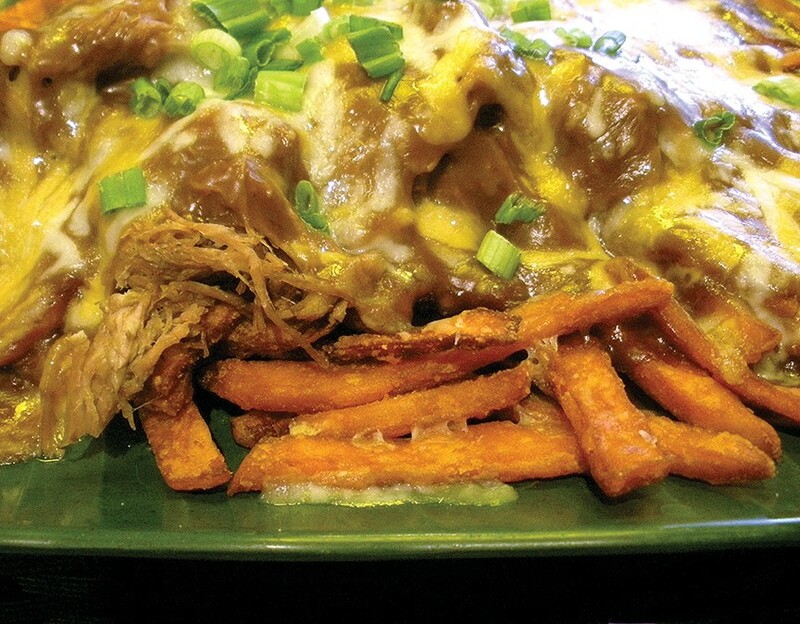 The platter of french fries smothered in pulled slow-roasted pork with gravy, melted cheese and green onions is the sort of dish that could only come from a culture that once worshipped volcanoes. You will need forks and napkins. Many napkins. It's a rich, messy treat and the meat is so tender that there is real danger of wolfing it down and being unable to eat the fish tacos or the loco moco you ordered. Also lovely are the sweet potato fries, which allow you the illusion of eating something healthy. (It's a super food!) But what if that wonderful, obscene lava spill of pork covered a plate of sweet potato fries instead? Had our waiter not been so friendly, I might have resisted the urge to experiment. It was only an extra $2 to make the switch. Would the sweetness be too much? Had I gone too far? Anytime you want something extra from a Hawaiian menu, the answer is yes. And yet the sweet potato makes this sharing plate a legitimate meal since the fries are not only a vehicle for toppings. Even the cold leftovers are drag-your-fingers-along-the-corners-of-the-container delicious. 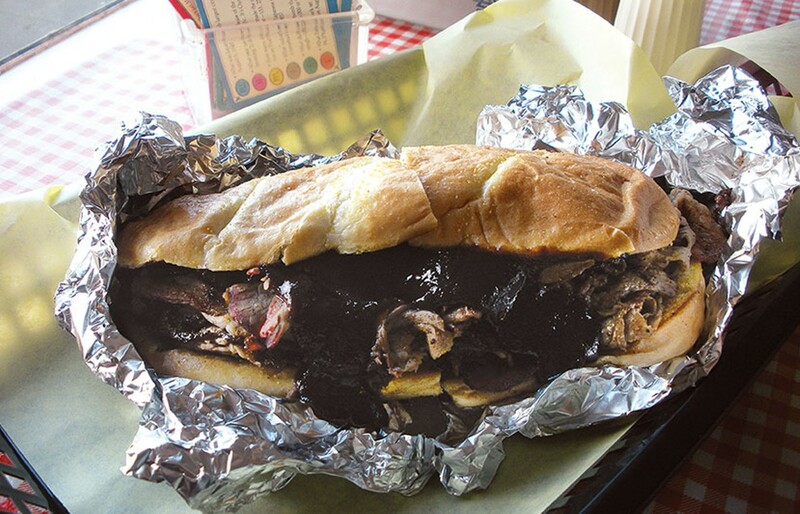 Many mourn the closure of Porter Street Barbecue in Arcata. The anger stage of our collective grief focused on the local attorney who has become the Voldemort of Humboldt County. Are we ready to celebrate the remaining Eureka branch of Porter Street (605 Broadway)? Blind Justice can still smell the smoke funneling up from the outdoor carousel of meat. Barbecue is a cuisine of factions and schisms (the sauce vs. rub battle is particularly divisive). But the tri-tip sandwich on garlic bread is a uniter, not a divider ($10.78 with cheese). It is a meal I have not only enjoyed, but given to others in thanks, as salve for disappointments, by way of apology and as straight-up bribery. Go ahead and declare the inclusion of Provolone cheese blasphemous — the rest of us will let it melt into the top half of the bun while the juice from the beef drips into the garlic-buttery bottom half. A little cup of sweet pickles and homemade sauce on the side is just the vinegary tang to set off the meat and power you through what can be a daunting beast. What's your go-to order? Email Jennifer@northcoastjournal.com and tell me what's good around here.